ලංකාවේ අපේ අදහස් Google Internet Web Site අධ්‍යාපනික දෑ. කිසි වියදමක් නැතිව සරල Uploader Web App එකක් හදාගමු. කිසි වියදමක් නැතිව සරල Uploader Web App එකක් හදාගමු. ලංකාවේ අපේ අදහස් 1:43 AM Google Internet Web Site අධ්‍යාපනික දෑ. තමන්ටම කියලා පොඩියට Hosting Server එකක්. නැත්නම් File Sharing වගේ සරල පොඩි Files බෙදාගන්න පුළුවන් එකක් තිබ්බොත් කොහොමද. හරිම සරලයි Hosting වලට සල්ලි නොයවා තමන්ගේ තියෙන Google Drive එක භාවිතා කරලා ඒ දේ කරගන්න පුළුවන්. Share කරන්න ඕන කරන Link එක පවා Generate වෙන නිසා වැඩේ ලේසි. 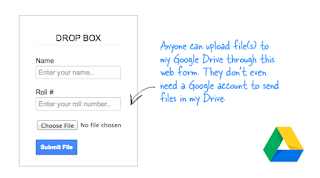 අනිත් අයට උනත් මේක හරහා ඔයාගේ Google Drive එකට Files දාන්න පුළුවන්. හරි කරන්නේ මෙහෙමයි. වැඩි කතා ඕනේ නැනේ..
ඔන්න ඔය වගේ Page එකක් Log වේවි. ඔතන තියෙන Share Button එක ඔබලා ඕක ඔයාලගේ Google Drive එකට දාගන්න. ඔන්න ඔය වගේ තියේවි ඊට පස්සේ. 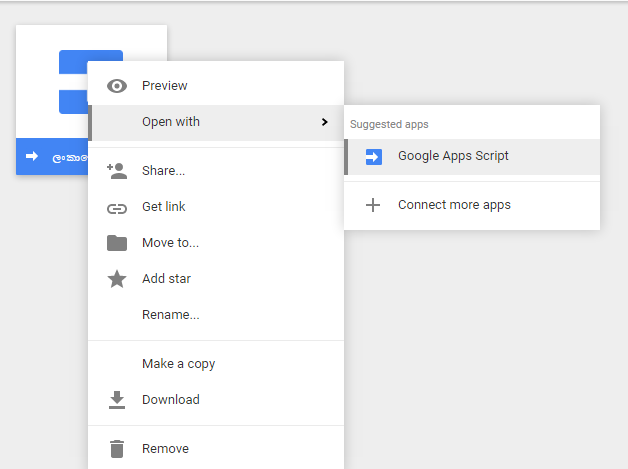 ඊට පස්සේ ඕක උද Right Click කරලා Open With - Google App Script තෝරාගන්න. ඊට පස්සේ මේ වගේ එකක් Open වෙයි. ඔයාට වෙනස්කම් කරන්න ඕනේ නම් මේ ටික බලන්න. Student File - Files Copy වන Folder එකේ නම. Upload By - වෙනුවට කැමති එකක්. File Uploaded Successfully - වැඩේ ගොඩ කියල වගේ කැමති එකක්. ඊට පස්සේ ඔතනදි තෝරන්න ඕනේ App එක Execute කරන්නේ කවුද ? කාටද Permission දෙන්නේ කියලා. ඕකත් තෝරලා බේරලා ඉවර උනාම Sharing Ling එකක් දෙයි. එක Web Browser එකේ Copy Paste කරලා Run කරලා බලන්න. Html Design කරන ටික ඔයලට බාර කරනවා.. සරලව Upload එකක් තමා ඔය. මෙන්න ඕක භාවිතා කරලා හදපු Uploader App එක - Click Here. Gu Family Book කතාමාලාව Direct Download කරගන්න.